I am writing this with respect to those asking me what they need to do to succeed in catfish and tilapia farming. Now let's know the details😎. Fish farming as we know it is very profitable, but when the right steps are not taken could lead to huge losses. Here are the three basic knowledge or secrets you need to arm yourself with if you want your fish farming to be profitable. Seed here refers to the fingerlings or juveniles you stock or you want to raise. The type of catfish or tilapia fingerlings you stock are very important for profitable catfish farming. Those days I was new to catfish farming, I made a lot of losses from buying runts(poor growing fingerlings). No matter how good the feed is or how much they are fed they never convert fast. Don't make the same mistake I made. Insist on high quality, healthy and good breed of catfish seeds that grow fast. Choose a reliable, tested and trusted hatchery or catfish seed supplier for your catfish fingerlings. 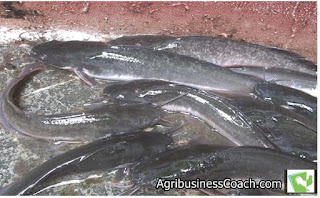 This is very important to make good profits in catfish and tilapia farming. The profitability of catfish farming also depends highly on the quality of the pond water. Just like you and I won't be healthy in a polluted environment, fishes get sick and may die in low-quality water. Remember the water is where they get oxygen and also pass out wastes. Fish pond water of good quality should have the following characteristics. The water temperature should be conducive for optimal growth of the fishes. Water temperature affects the feeding and growth of catfish. A sudden change of about 5 degrees Celsius in pond water will cause stress to catfish and in some cases lead to death. Catfish grow best when water temperature is between 25 and 30 degrees Celsius. Water is said to be turbid when it is not clear due to the presence of clay or silt particles or(and) algae or plankton. Though algae and plankton are beneficial to catfish both as a food source and dissolved oxygen, excess production may be harmful because it will reduce light penetration and dissolved oxygen. In another hand, turbidity due to clay and silt particles negatively affects fishes because apart from preventing light penetration, they clog up the gills of fish reducing the surface area for oxygen absorption. To prevent this, erosion or flood water should be prevented from entering the fish pond. The dyke of earthen ponds should be planted with grasses to filter silt and clay from entering the pond. pH of pond water describes the acidity or alkalinity of pond water. This is measured with a pH meter. For catfish farming, water pH should be between 6.8 and 8.9. Values outside this 6.8-6.9 may not support proper survival and growth of catfish. High water acidity affects the presence of natural fish food(planktons), dissolved oxygen and accumulation of toxic substances in pond water. Just like living things need oxygen, Fishes obtain their oxygen from water don't want to be suffocated😄. So dissolved oxygen in pond water is a very important water quality, as low dissolved oxygen in water could lead to the death of catfish. Click to Read more about low dissolved oxygen in fish pond water and how to solve it. Dissolved carbon dioxide which is a waste product of decaying organic matter in water. Planktons also give out carbon dioxide when they respire. Carbon dioxide in pond water should be minimal while oxygen should be high. This is necessary for the semi-intensive and extensive system of fish farming because planktons and other aquatic plants depend on the availability of such nutrients like nitrogen, phosphorus, potassium, and others to survive for providing dissolved oxygen and food to the fishes. Low dissolved oxygen can be improved by adding organic or inorganic fertilizers at required quantities. Examples are frogs, alligators(predators), leeches(pest and parasite), harmful fungi, bacteria and virus(pathogens). This can be achieved by maintaining farm hygiene and keeping visitors who may carry disease from other farms away from your ponds. Poor quality feed or adulterated feed could lead to poor growth of catfish and tilapia. Adulterated or low-quality fish feeds may be expired, contain expired or substandard feed ingredients, lower nutrient, protein or energy content than indicated on the label or required by the fish. Catfish and tilapia at the different stage of their growth(fries, fingerlings, juveniles, grow-out, broodstock) have different nutritional requirements which need to be supplied for fast growth and development. When poor quality feeds or adulterated feeds are given, the fishes do not grow well or even die if the feed is toxic. High-quality fish feeds leads to a higher growth rate of fishes. High-quality feeds are better digested are better digested and a lesser amount of wastes are produced leading to high feed conversion ratio (FCR). With high quality feeds you can grow more number of fishes in a smaller place. Quality feeds for your fishes should be taken very seriously. Ensure you have an accredited and reliable fish feed dealer and when making your own catfish feed, use high-quality feed ingredients. So now you have the 3 basic keys to a profitable catfish and tilapia farming business. PLEASE click the facebook like button below and share on Twitter .